The North Fork of the White River is known for a number of things, floating and trout fishing in its cool, clear water chief among them. What is unexpected is a mid-century modern lodge perched atop an island overlooking Rainbow Springs on the North Fork. Designed by architect Barry Evans, the mid-’60s lodge almost blends into the landscape, but contains a delightful number of period-perfect architectural details inside and out. Dorothy Carpenter says the home was built on land acquired in the 1920s by her grandfather Birch Mahaffey. Rainbow Springs itself wasn’t for sale — it was owned by a company with plans to develop around it — but an adjacent 6,000 acres was. So Mahaffey bought up the surrounding land and bought a one-fifth interest in the company. “That makes it seem obvious to me that he wanted Rainbow Springs,” Dorothy says. When the stock market crashed in 1929, “that stopped the development in its tracks,” Dorothy says. Birch bought the land and it remains in the family to this day. Over the years, the family built and rebuilt a series of fishing lodges. The moisture of the valley doesn’t do wood any favors. But when it came time for Birch’s four daughters to build a new lodge, they went in a fresh direction. They decided to move the lodge to an island where they could just look outside to see the river and springs. They enlisted the help of architect Barry Evans. “Their main concern was, we want it to blend in. We didn’t want to have something that expands like a monument … they wanted it to be a platform from which you could view the spring,” Dorothy says. The architect interviewed everyone in the family before settling on a design. The result incorporates elements of Frank Lloyd Wright and the modern esthetic of the ’60s. “I always think as far as the style goes, it’s very much like a place Don Draper would take his clientele for a fly-fishing trip,” Dorothy says. Over time, though, maintenance became an issue and, of course, occasional flooding. With the family living four hours away, they were dependent on caretakers to keep the house up. The expenses were mounting and, finally, the family decided maybe it would be best to sell it. That’s about the time she met Myron McKee, owner of River of Life Farm and Treehouse Cabins, just down the river. That’s all Dorothy needed to hear. She, her sister and a cousin bought the property from the family. Myron pitched in money to help replace flooring and drywall, fix the leaking skylight and generally spruce the place up with new paint and air-conditioning units. “He put a lot into that house. He was meticulous about keeping the character and design … I can’t believe (the answer) was just downstream, just when I needed it to happen. I was searching for the way to save the spring, and here comes Myron,” Dorothy says. The goal now is to make the property self-sustaining by earning money through renting the lodge. Half of the profits are invested in maintaining the property and Myron’s half of the profits go to support the Kolkata Tree House Home, an orphanage his son founded in India. They have a full-time caretaker and Myron will manage the property just as he has his 11 other rental cabins for the last 20 years. “We have only our lifetimes to make this self-sustaining,” says Myron. “I feel I owe it to human beings to preserve it, and my sister and my cousin feel the same way,” she says. 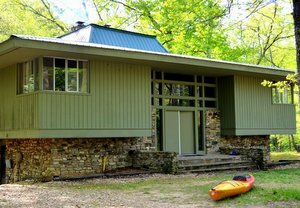 What: Rainbow Springs Lodge, a mid-century modern lodge located on an island overlooking Rainbow Spring, on the North Fork of the White River. Where: Available through River of Life Treehouse Cabins, 1746 River of Life Drive, Dora. Cost: $850 per day for up to eight people (two-night minimum); can accommodate up to 14 lodgers for additional fee.